Softback, green soft card covers, 8.25”x 6.75” 88 + (8)pp including adverts at front & rear. Numerous comical drawings in text by Fougasse. Black lettering on front & spine, drawing of man in overcoat & trilby carrying parcels with silver background on front. Quite a scarce publication, sought after by collectors because of the cartoons by Fougasse. (Cyril Kenneth Bird, pen name Fougasse (17 December 1887 – 11 June 1965) was a leading British cartoonist, perhaps best known for his editorship of “Punch”magazine and his World War II warning posters, “Careless Talk Costs Lives” etc.. He also designed many posters for the London Underground. During the 20s, 30s and 40s, many freelance contributors to “Punch” supplemented their income by writing brochures and booklets for the Main Line railway companies,, mainly of the “Rambling Over the Hills” type). Ernest Pendarves Leigh-Bennett (c.1882-1937) was a magazine journalist and novelist employed by the Southern Public Relations Officer, John Elliot initially to write a monthly article for the season ticket holders relating to train services called “Over the Points”, and then guide books to countryside and golf courses served by the Southern. 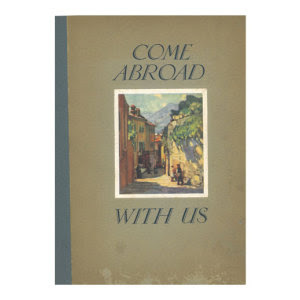 He wrote one quite lengthy book for the Southern“Come Abroad With Us”, an amusing partly fictionalised account of a tour through Europe with the artist Leonard Richmond, who illustrated the book with a variety of art works. “Southern Ways & Means” also has quite a light-hearted style, and seeks to introduce the SOUTHERN and all its services (including curiosities, like a combined rail and air parcel service to Karachi, not exceeding 200lbs. for £2-8-4d. Boat Trains and steamer services are given thorough coverage, including the best description I have seen of which trains left which London terminus at what time. It is quite depressing to read of the many services and facilities that have vanished including special trains on advertised days, with Luncheon and Tea Cars, to visit the works at Eastleigh, Ashford and Lancing, or take a conducted tour over an ocean liner at Southampton. The proud boast is also made that if you order a “Special” at a London Terminus, it will be at the platform ready to leave within 30 minutes. Nothing sums up this wonderfully nostalgic book better than the advice on page 9 “Above all don’t send your chauffeur or valet on in advance (to register your baggage) unless you provide him with all your tickets and tell him clearly by which route you are travelling”.